Those gorgeous mala beads you see your yoga instructor wearing are actually more than a fashion statement. These strings of beads are actually a traditional tool of meditation and prayer used by a variety of cultures across the world. Used for japa meditation, where the focus is on repeating a mantra or word, you may find mala to be a useful addition to your meditation practice. 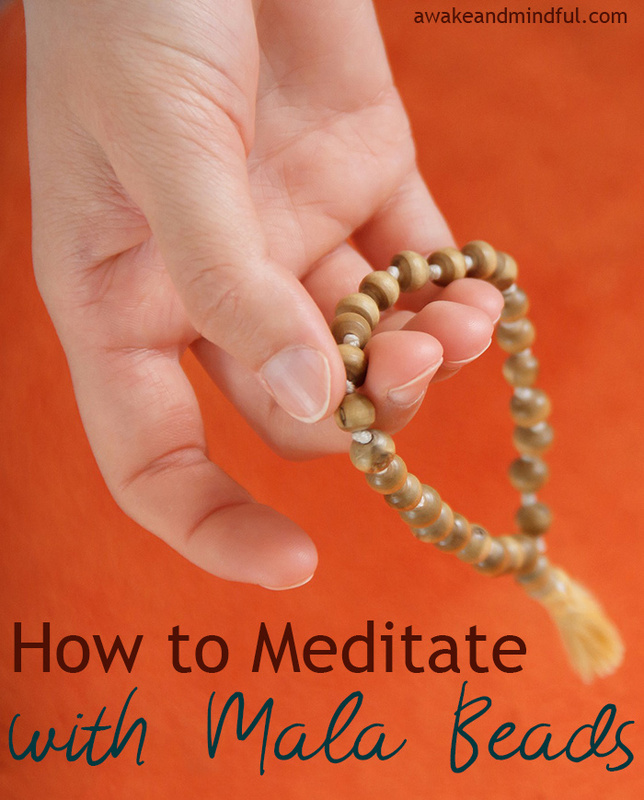 This article covers everything you need to know about how to use mala beads for meditation. What are mala necklaces and bracelets? Mala beads are known by a lot of names. You may see them referred to as japamala, prayer beads, meditation beads, mala necklaces, mala bracelets, or mala jewelry. They’re commonly used by Buddhists, Hindus, Jains, and some Sikhs for the meditative practice known as japa, which involves focusing on the repetition of a mantra. The mala itself usually has 108 beads and is used during meditation as a way to count of repetitions or breaths. The beads can be made from a variety of woods or gemstones. The different stones and colors can have meanings and intentions associated with them. Sandalwood malas (pictured) are extremely common and an affordable starting point for many beginners. You’ve also probably noticed that most malas have a tassel or guru bead (aka sumeru, bindu, or stupa). This is to mark the beginning and the end of your meditation. 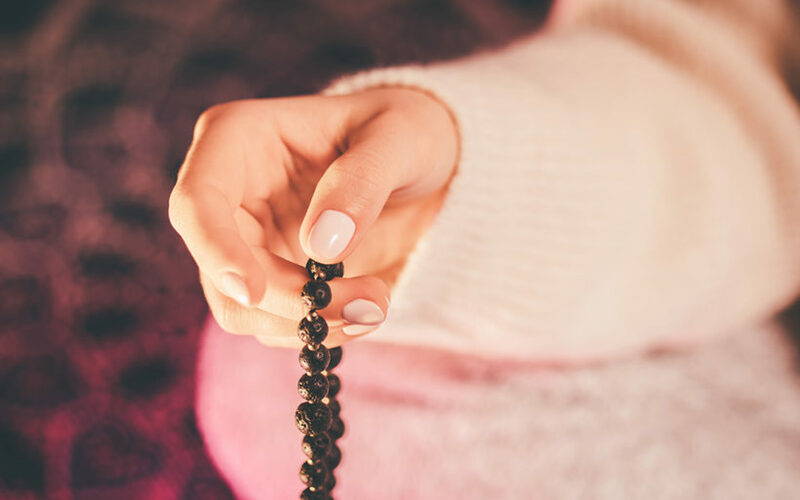 In addition to being a counting tool, malas are helpful to keep your mind focused and help guide your attention if your mind drifts. Malas can be worn as a necklace or a bracelet and have become a trendy fashion accessory among many yoga practitioners in the United States. Once you’ve mastered the basics of meditation, it’s easy to incorporate mala into your practice. They can be used in any meditation position, without or without the assistance of a bench or chair. Watch the video for guidance or read the steps below. Take your normal sitting or kneeling position for meditation. Decide on the mantra you will be meditating on and how many repetitions you want to achieve. Using your right hand, drape the beads over either your middle finger or the ring finger. Repeat the mantra in your mind, drawing the mala toward you with your thumb. One bead equals one repetition. When you reach the guru bead, that counts as 100 repetitions. You should not cross the guru bead, so to continue your meditation you will rotate the mala. To do this with one hand, grasp the final bead with your thumb and pointer finger (if draping over the middle finger) or middle finger (if draping over the ring finger). Slide the draped finger out and insert it from the other side. Om – This is one of the most well-known mantras, the one common folks think of when they imagine monks meditating. Om is a sacred sound and used as a mantra in Hinduism, Buddhism, Jainism, and Sikhism. In Hinduism, om refers to the self or soul (Atman) and the divine truth or reality (Brahman). It can be used on its own or is often used at the beginning of mantras. Sat Nam – This Gurmukhi mantra translates to “Truth is my name.” When spoken in the mind, the “Sat” should be held eight times longer than “Nam.” This mantra will help you find your intuition and can invigorate sexual energy if focused on daily. Neti-Neti – This Sanskirt phrase translates to “not this, not this” or “neither this, nor that.” This mantra is good for negating something in your life, whether it’s a situation, a feeling, or something you want to change. If you’re interested in a more secular meditation, you can pick any word that resonates with you and your goals. Common words like love, freedom, and peace make wonderful mantras. 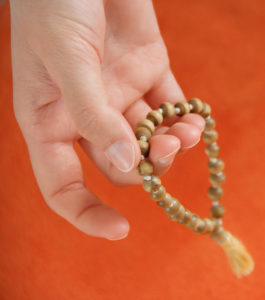 If you do not want to meditate on a mantra, you can use your mala to count breaths instead. When it comes to japa, the type of mala used does not matter. What is important is the sincerity of your practice and the attitude you to bring to it each day. When selecting mala beads, you can choose them based on color, feel of the beads, price, or any other aesthetics that appeal to you. If you purchase a mala made of gemstones, the stones themselves often have meanings and healing energies that can positively affect your meditation and support your intention. Learn more about mala beads meanings by colors. If you’re interested in using a more traditional mala, look for ones made of rudraksha (bodhi seeds), sandalwood, or lotus seeds, which are often more affordable than malas made of gemstones. Now that you know how to use mala for japa meditation, pick out the perfect set of beads based on mala meanings by color.